The 20th year of marriage is a big milestone; you may have had one or more children who are now off at college or who have otherwise flown the nest, or your kids may be right on the verge of doing so. In all likelihood, the next 10 years will bring some additional alone time together. Your 20th anniversary is a year for looking back and looking forward. Reflect on the commitment to a lifetime marriage that the two of you have made as you celebrate this special time. 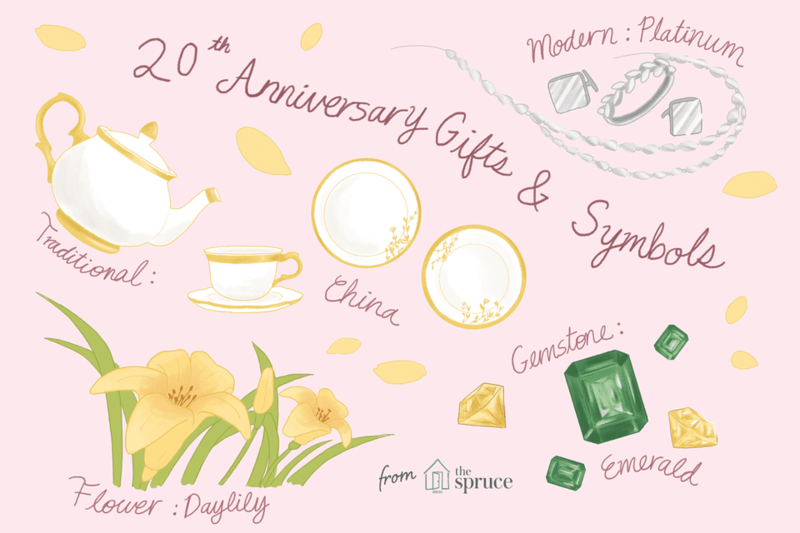 Here are some 20th wedding anniversary ideas and symbols to help you choose the china or platinum gifts that are associated with the event. China is traditional, while platinum is considered modern, but both work. China symbolizes the beautiful, elegant and delicate aspect of your love over the past 20 years. Don't confine this to dinner plates that you sit down with only on special occasions. Think of gifts of picture frames, perhaps around photos of special times and milestones, or even figurines that reflect the tastes of the couple. Platinum is strong and enduring, just like your 20-year old marriage, and it offers a multitude of gift possibilities as well. Think jewelry including rings, necklaces, and earrings, accessories such as cufflinks or money clips, or a platinum-dipped rose or two. The official 20th-anniversary gemstone is the emerald, but you could also go with a yellow or golden diamond. Think of setting the stone in platinum to make it a perfect gift for this anniversary. You can give gems in earrings, rings, pendants, or pins. Either emerald green or white can be used as a traditional 20th-anniversary color. What to do with it? Think of things that traditionally come in this color. They can be silly or sweet or a combination of both. Use these colors to decorate for the occasion, including tablecloths, streamers, balloons, and cake decorations. The 20th-anniversary flower is the daylily. Daylilies are rugged and strong, just like your marriage, but this flower also represents coquetry, such as the flirting, playful behavior you have toward each other and that has sustained your love for 20 years. If you want to give a rose that's symbolic of the 20th anniversary, consider a china vase. You might also give a china doll or a visit to your area's local Chinatown. Hop a flight to the most memorable Chinatown of all in San Francisco if possible—it's the largest anywhere other than Asia. Plan an anniversary party using a Chinese theme and use Chinese lanterns for decorations. Plan an outdoor picnic, then use real china plates and cups. Put new paper money—dated with the current year—inside a china cup or bowl with a single daylily or a piece of emerald jewelry. Coupons are always a nice touch, too, promising redemption for an event or time that your spouse will always remember.